The first sign of spring after a long, chilly winter is a welcome sign to many. It often triggers thoughts of—and subsequent preparations for—finally spending time outdoors. A great way to enjoy the upcoming season is by relaxing in your own comfy outdoor living space. But after months of disuse, how do you even begin to dust off your old outside haunts, let alone make them stylish and lively again? If you have the space for it, why not install new flower beds, bushes, small trees, or other types of shrubbery? Nothing says spring like green, green, and more green. If that’s a little too much, you can always install potted plants and bushes around your patio. These are easier to move around and reposition compared to flower beds, anyway. For your patio, porch, or outdoor living/dining area, add little pots of succulents or tall flower vases with single-stem flowers for pops of color. If you’re not too fond of regular watering, trimming, and general potted plant care, don’t worry; there are plenty of beginner-friendly shrubs, flowers, and succulents that require minimal maintenance. You can always ask your local landscapers to recommend the ones that would work best for your skill level and backyard. Your patio is an excellent spot for cool rugs and curtains. There is a huge range of outdoor rugs that come in different sizes, shapes, and colors that can make your outdoor living space more visually inviting for guests. You can also add texture and definition to your living area by hanging curtains in bold hues or contrasting/complementing colors. Aside from being wonderful decorative pieces, curtains provide can provide a modicum of privacy. With the cool spring breeze fluttering your curtains and the lush rugs looking warm and inviting, your backyard might even end up looking (and feeling) like a luxury resort. You won’t have to spend big bucks for a day at a resort when you can relax in the cool luxury of your own home. Installing a fire pit in your backyard is simple enough to do, but the results are so worth it. Fire pits are beautiful, practical, and provide a sort of central point where family and guests can easily gather around. Even if the chill of winter is gone, the warmth of a fire pit on a cool spring night is just as delightful. Fire pits come in hundreds of different styles and use a wide variety of materials, which means finding one that fits in with the desired look and aesthetic of your outdoor space is easy. 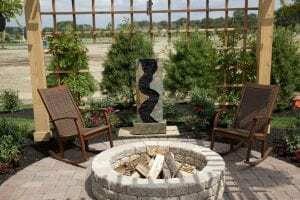 Some professional landscapers can also help customize a fire pit to perfectly suit your vision. Such services will cost extra, of course, on top of the initial placement and installation. To make your outdoor space look great even at night, try wrapping string lights (or faerie lights) around trees for that whimsical enchanted forest effect. You can also fill a birdcage or hanging lantern with lights for a more rustic, down-to-earth look. Meanwhile, LED or solar-powered lights are great for illuminating the edge of your patio. You can add a few simple elements to your outdoor living space or refurbish your whole patio for spring—the choice is entirely up to you. Regardless of how you want to do it, make sure you enlist the aid of a professional landscaper, even if it’s just for consultation. After all, you want to make sure you and your family can enjoy the updated space for many years to come. Are you planning a patio update soon? AJ’s Landscaping can help you achieve the look you want for your home. Call us today to get an estimate.